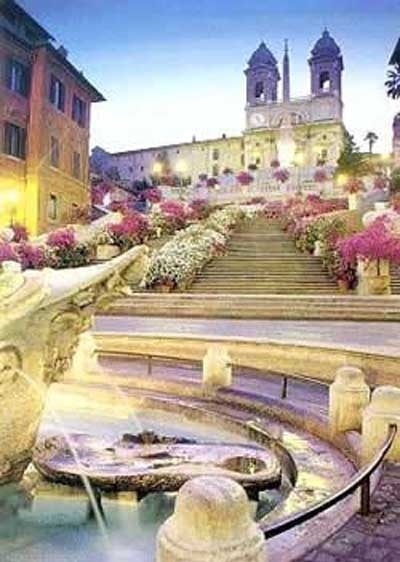 The Spanish Steps are a set of steps in Rome, Italy, climbing a steep slope between the Piazza di Spagna at the base and Piazza Trinità dei Monti, dominated by the Trinità dei Monti church at the top. The Scalinata is the widest staircase in Europe. The monumental stairway of 135 steps was built with French diplomat Étienne Gueffier’s bequeathed funds of 20,000 scudi, in 1723–1725, linking the Bourbon Spanish Embassy, and the Trinità dei Monti church that was under the patronage of the Bourbon kings of France, both located above — to the Holy See in Palazzo Monaldeschi located below. The stairway was designed by architects Francesco de Sanctis and Alessandro Specchi.